Janaration's jewelry is inspired by yoga. We don't know exactly how that works, but just looking at this necklace makes us feel calmer. 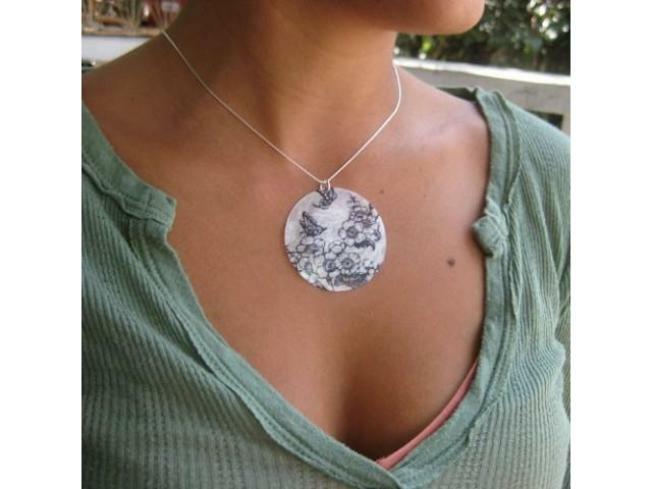 DOWNWARD DOGWOOD: A local artisan at Janaration crafted this exquisite necklace from a Capiz shell. It's yours for a very reasonable $25. PURSE UPDATE: The results of the poll on the purse we bought were mixed to say the least. Comments from SoBay and Facebook included "a bit much," "disgusting," and "Fraggle Rock." But we only said that we'd count SoBay votes, and there weren't enough to make it a true poll. We decided to keep the purse and got a lot of compliments the night we took it out on the town. So, there! FASHION NETWORKING: Fashion social networking site UsTrendy relocated their headquarters to the Bay Area this year. Want to get the inside scoop on how it works? Our friend at SF Indie Fashion has the info.